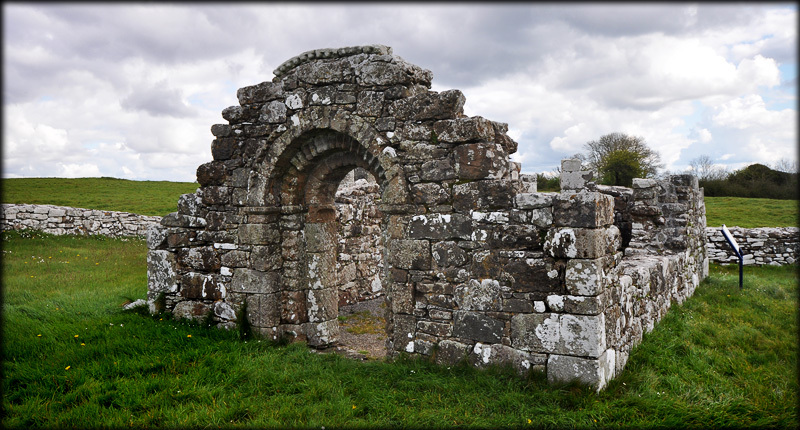 Southwest of St Caimin's Church and the bullaun stones is a small 12th century romanesque church dedicated to St Brigid. The church is 5.9 metres long and 3.5 metres in width. The west doorway, which is decorated in the romanesque style, has three orders. This doorway completely collapsed in the 19th century and was rebuilt in 1890. The church was originally surrounded on three sides by an earthen bank, but is now enclosed by a stone wall, the southern part of which was built in the 13th century as part of an enclosing wall of the new parish church, St Mary's. The other walls were added later. 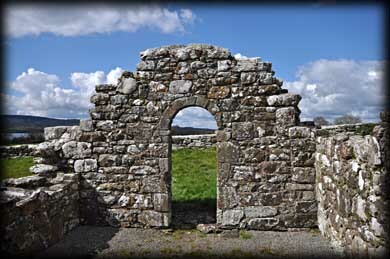 By that time St Brigid's was no longer used as a church although there is evidence it was used for burials. During the last century the church was known as the piggery as the enclosure was used for that purpose. Next stop the Holy Well. The Southern wall of the enclosure with it's arched doorway, the original entrance to the grounds of St Marys. 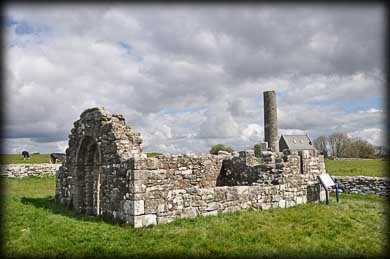 Situated: St Brigid's church is located 100 metres south west of the round tower at the monastic site on Holy Island - Inis cealtra on Lough Derg, County Clare. Discovery Map 58: R 6976 8496. Last visit April 2012.